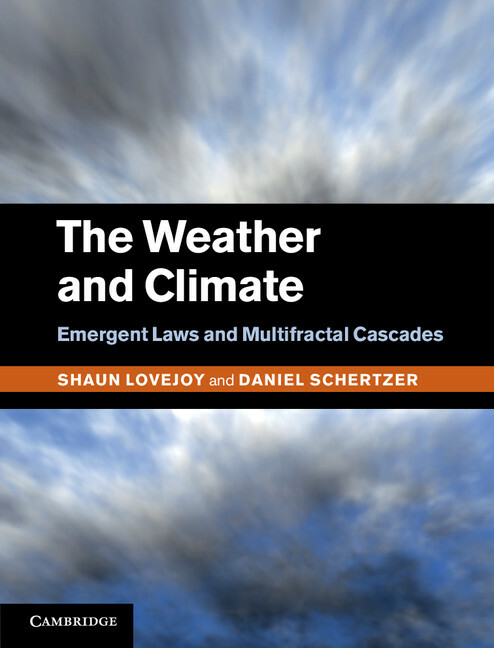 Shaun Lovejoy is the co-author of The Weather and Climate: Emergent Laws and Multifractal Cascades (2013). Lovejoy is Professor of Physics at McGill University, Montréal, and has been a pioneer in developing and applying new ideas in nonlinear dynamics to the geosciences since the late 1970s. This has included multifractals, generalized (anisotropic) scale invariance, universal multifractals, space-time multifractal modeling of geofields (especially clouds, precipitation and topography). He has published over 200 papers applying these ideas to the Earth and environmental sciences. In addition to these scientific contributions, Professor Lovejoy has actively promoted nonlinear processes in geophysics by co-founding the Nonlinear Process section at the European Geosciences Union (EGU) and the Nonlinear Processes in Geophysics journal. He has been Vice-chair and subsequently Chair of the Nonlinear Geophysics focus group at the American Geophysical Union (AGU) since 2004.